Oia Suites is located on the outskirts of the picturesque town of Oia. With stunning views of the volcanic islets and the famous cliffs of Santorini, the property offers free parking and free Wi-Fi. Traditional suite with a TV, a separate bedroom and a private bathroom. It has balconies with views of the volcano, the caldera and the sunset. Upon arrival, the minibar includes free water. This romantic suite with a private balcony offers views of the volcano, the sunset, the caldera and the Aegean Sea. Upon arrival the minibar has free water. It has a balcony with views of the volcano, the sunset, the caldera and the Aegean Sea. It has a seating area, a bedroom and an outdoor hot tub with views of the sea and the caldera. Upon arrival, the minibar includes free mineral water. It has a large outdoor hot tub with direct views of the caldera and the sea. It has a private balcony with views of the volcano, the sunset, the caldera and the Aegean Sea. It has a spacious living area and a bedroom. Traditional suite with a TV, a separate bedroom and a private bathroom. It has balconies with views of the volcano, the caldera and the sunset. The minibar includes free mineral water upon arrival. This modern suite combines luxury with minimalist design and features an outdoor hot tub with direct access to the caldera and sea views. 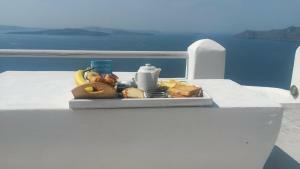 It also has a private balcony with views of the volcano, the sunset, the caldera and the Aegean Sea. It consists of a living / bedroom area. Upon arrival, the minibar includes free water.